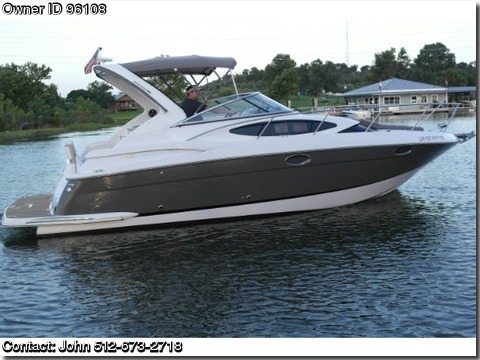 Contact the owner John @ 512-673-2718 with any questions.2011 Regal 3060 Express Cruiser Meticulously kept Window Express Cruiser! Cleaner than new with huge savings! The dramatic, flowing silhouette of the 3060 is clearly of the Regal Yacht bloodline. Bright and airy interior is also spacious. The mid-cabin is large enough to be the master stateroom. The innovative cockpit forward seating arrangement puts the captain in the center of the action, teakwood table can be set up for a nice lunch or dinner on the water or you can convert to a sun lounge for soaking up the rays.multiple seating areas as well as a cockpit sink with fridge.The 3060 features the most livable cabin, full queen size and widest mid cabin opening in its class.Cabin windows provides the largest amount of natural light.Largest head compartment with 6 foot 2 inch headroom.Largest galley with Corian countertop, refrigerator, microwave and storage.Cherry and Holly hardwood floor and cherry entry steps.LeatherCrest interior upholstery.A beam of 10 foot 6 inches is larger than most competitors.Stainless steel windshield header for increased strength, style and durability.Standard dockside water inlet for a continuous supply of fresh water.Oceantrac hull provides superior handling and balance.Air conditioning with reverse cycle heat 16000 BTU.Anchor windlass w/ anchor and rodeFull cockpit canvas package to extend your boating season as well as small custom canvas cover for storage.Upgraded fusion stereo system with Garmin chartplotter 5280.Flat Screen TV's in both cabins with dvd player. upgraded inner spring mattresses for all the comforts of home.Galley sink microwave oven and ceramic cooktop. (never cooked in)5kw generator for comfortable overnighters off shore.Twin Volvo 5.0 GXI DP blue led underwater lights, bilge heaterfull head with vacuflush toilet and shower (shower never used)You will see from the pictures this vessel is in tip top shape as close to new as you can get in a pre owned boat.Act Now this one will not last!